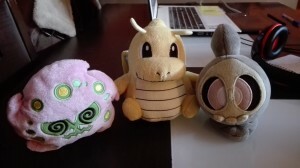 Last week I got some plushes in the mail from my middleman, the best part with this sort of packages is that since I store them for as long as I can before shipping I often forget what one of them might be and this time it was no different! I knew I had 3 common Pokedolls (the Swords of Justice) and 3 rare ones... it was one of the rares I didn't remember, so it was a self surprise from the past! These three I remembered, I got all of them together each with a different tag status. 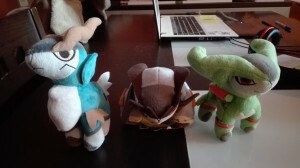 Aramis the Cobalion is TTO, Porthos the Terrakion is fully tagged (although the hangtag is all crumbled and such), and Athos the Virizion is tushless. Nevertheless I'm really happy to have the three of them! They've been on my list for a while and having them come from the same place adds to them being a team c: now I'm only missing one of the Keldeo Pokedolls to have all the swords. And here come the rarities! Out of the bunch Duskull was my surprise! These three I've been wanting for a good while. I missed getting Spiritomb while it was common during DPPt (I missed getting many of that era as they came out) but I'm really thankful I got her (her name is Malefice) for quite a steal! Duskull I've wanted one ever since I learnt of its existance, he came from the same seller as Spiritomb and was also a steal! I couldn't believe my luck! And then my luck decided to throw me a curve ball a few days after and show me this Dragonite you have before your eyes. When Dragonite PD came out I wasn't too fond of it, but as years went by (and its availability was no more) I fell more and more in love with it, it's so goofy and fat. To my luck it was also at quite a steal! Sleeping Pachirisu Kuttari!!! I yelled when he popped out the package! 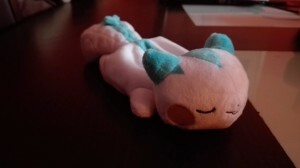 You see, for the past year I've been helping her Pokemon GO community group by illustrating charity badges (proceeds go towards the Food Bank) and the group organiser got me this kuttari as thanks for the help ;w; he's now sleeping on my kuttari pile.